Thanks, Teresa! So glad others are enjoying it. It’s been really nice to revisit a childhood obsession in a new way. Thanks, Rebecca! This would definitely be my favourite, were it still standing! Wonderful, fascinating! Do return to windmills some day – I love them and these ‘constructions’ of yours have been great. Thanks Michael, it’s great to know others are enjoying them. Have no fear – I’m sure I’ll come back to them soon enough! I can’t swim very well is the story! I was the kid at school who always had to wear the armbands for fear of drowning. Ok, so i know by now that you have ways of making things look 3D/ real, but i’m still convinced the first one is a photo. Is it?? Which certainly suggest its size rather more clearly! Ha – I’ve always said that, if I got rich, I’d build myself a windmill to live in. Wouldn’t it be magical? Either that or I’d just buy Weybourne. I’ve been longing for that one since I was a nipper. 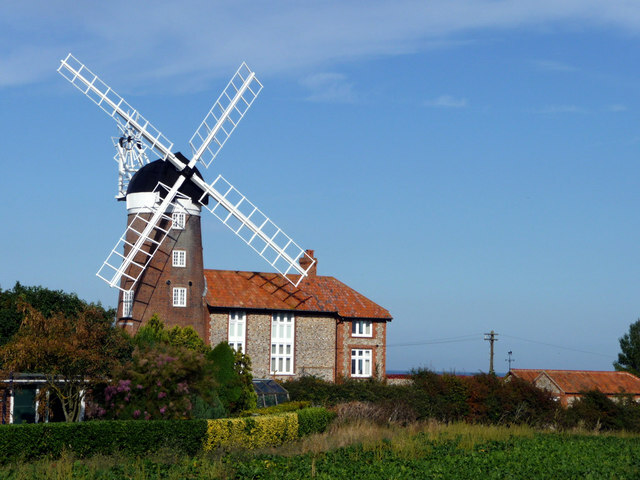 I had to google Weybourne, but oh, what a pretty place it seems. I’m assuming it’s the Weybourne Mill you’d choose for your dream home, then? It’d make a nice abode, i reckon. Note to self: Time to get rich!! Hahaha! Knowing me, I would totally go in for one-upmanship. It’d end with a windmill so big it consumes the earth, surely!